Corridors of Powers interconnected through Marriages & Partnerships. Ch. Munir started from managing Property of Sheikh Zayd (rulers of Abu Dhabi) in Pakistan. Then Ch. Munir’s sister was married to Sheikh Zayd of UAE. Ch. Munir’s daughter married to Mian Aamir of Duniya TV and Punjab group of Colleges. Ch. Munir’s Son married to Maryam Nawaz’s daughter. Ch. Munir’s Sister-in-Law married to Corps Commander Karachi, Lt Gen Naveed Mukhtar, the new DG ISI. Ch. Munir’s partner is Brig (R) Mukhtar, father of Lt Gen Naveed Mukhtar. Ch. Munir is a contractor of new Islamabad Airport. With the support of some state actors and after its defeat by the Russian-led coalition of Iran, Iraq and Lebanon-based Hezbollah in Syria and Iraq, the Islamic State group (Also known as Daesh, ISIS and ISIL) is rapidly spreading its tentacles in South Asia. It is also due to the dual policy of the US-led some Western powers, Israel and India that ISIS which is most dangerous terrorist group than Al-Qaeda has accelerated terrorism-related attacks in the US, Europe, Syria, Turkey, Egypt, Yemen, Iran, Iraq etc. and some African countries where besides Muslims, the outfit also targeted the Christians. Now, its tentacles have reached other regions of Asia, especially South Asia. Hence, the emergence of ISIS threat in South Asia needs attention. In this context, the Daily Mail Online reported on February 22, 2015, “The terrifying rise of ISIS…tentacles now reach from Algeria to Afghanistan”. It is mentionable that the militants attacked the Holey Artisan Bakery (Restaurant) in the diplomatic district of Dhaka-capital of Bangladesh on July 2, 2016, and killed at least 20 hostages and two police officers. It included nine Italians, seven Japanese and one American. The ISIS claimed responsibility for the terror attack on the restaurant. Top officials of Bangladesh Government claimed the existence of ISIS in the country. ISIS has also accepted responsibility for several past attacks in Bangladesh. Taking cognizance of various terrorism-related assaults in Afghanistan and Pakistan by the ISIL, as its terrorists also entered Pakistan from Afghanistan, Pakistan has, repeatedly, been expressing concerns over the growing unrest and violence in Afghanistan, reiterating support for a dialogue-based settlement of the Afghan issue. Islamabad is supportive of an Afghan dialogue, recognizing Taliban as a legitimate party in the conflict. Similar stance has been adopted by Russia, China, Iran and even the Central Asian Republics. While Pakistan has expressed concerns over the emergence of ISIS in Afghanistan from where it has rapidly been spreading its terror-network in other South Asian countries. Islamabad’s worry is also shared by all the countries of the region. The dreaded terror outfit is being projected by the US, India, and some Western countries as a counterweight to Taliban. Therefore, the story of ISIS in Afghanistan is viewed carefully by the regional countries. Russia has repeatedly aired concerns about the possibility of tacit US approval or her inability to control the ISIS. Former Afghan President Hamid Karzai and few other Afghan leaders have also aired such apprehensions. In this connection, a news item was published by all the leading dailies of Pakistan on October 8, 2017 regarding the statement of Afghanistan’s former Afghan President Karzai who, while dismissing criticism of Moscow’s ties with the Taliban and echoing Russian claims of American support to the ISIS terrorists, told Voice of America (VOC) that the United States has links with terrorist ‘Islamic State’, also known as Daesh…Daesh a tool of US…After it [the US] dropped the [mother of all] bomb on Afghanistan, it did not eliminate Daesh…the terrorist group has been supplied weapons by the United States forces…The US Army helicopters and army bases are being used to provide assistance to ISIS terrorists…I do not differentiate at all between Daesh and America…Reports of American assistance to the terrorists are coming from all over the country.” (It also includes Karzai’s revelations to VOC of April 20, 2017, and Newsweek’s report of the same day). Particularly, based in Afghanistan, secret agencies such as American CIA, Indian RAW and Israeli Mossad are in collusion, and are using the ISIS in destabilizing Pakistan and Afghanistan as part of the double game of their countries. India and Israel want to prolong the stay of the US-led NATO troops in Afghanistan which has become the centre of their covert activities against Pakistan, Russia, China, and Iran. American President Trump is also doing the same in connivance with New Delhi and Tel Aviv. Now, the China-Pakistan Economic Corridor (CPEC) is the special target of these foreign intelligence agencies. While, Pakistan has repeatedly pointed out ISIS’s involvement in anti-Pakistan violence and terrorism, and Islamabad has also shared credible information about the presence of ex-TTP militants inside Afghanistan, many of whom have switched sides to join ISIS. Therefore, Islamabad expects Afghanistan and the US-led forces (NATO) in Afghanistan to check the activities and projection of the ISKP activities. Notably, ISIS has suffered heavily on accounts of its confrontation with the Afghan Taliban. Taliban have successfully undone ISIS influence from most of its controlled and contested areas. ISIS has lost most of its leadership in these fights and has been virtually squeezed to a few pockets of Nangarhar province. Taliban have been successful in checking ISKP’s (ISIS) ideological outreach by projecting the linkage of the brutal organization with extra-regional elements and thus discrediting them in the eyes of common Afghans. Most Afghans consider ISKP’s display of cruelties and inhuman behaviour against Afghan culture and do not buy group’s ideas of violence. Meanwhile, Pakistan has successfully purged FATA and Khyber Pakhtunkhwa of militants through successful military operations Zarb-e-Azb and Radd-ul-Fasad. Lately, the country is focusing on improving border management and fencing project to address the cross-border movement of the terrorists. Pakistan is making concerted efforts to address extremism in all its forms. Recent steps by the country, including the nationwide agreed upon ‘Paigham-e-Pakistan’ (Message of Pakistan), are efforts to address the menace of terrorism and extremism on the ideological front. In the same context, in the recent past, Pakistan’s Chief of Army Staff General Qamar Javed Bajwa in Munich Security Conference was a polite reminder to the US-led international community, especially the Western powers of their past practices in the region. We can conclude that reality of ISKP is well known to the regional powers. People like the ex-President Hamid Karzai and countries like Russia have been quite vocal in expressing their concerns about who supports ISKP? For ISKP in Afghanistan, the onus rests on the American- led NATO forces as well as on the Afghan National Unity Government (NUG) who need to carry out a reality check. America, India, and Israel should also abandon their double game with Pakistan, Afghanistan, Iran, China and Russia in order to cope with the emergence of ISIS threat in South Asia. In the changing geopolitical scenario, President Trump’s Afghanistan policy signifies tougher times for an already fallen regime. The US urgency for an exit from this decades’ old Afghan war is being felt by the policy thinkers and onlookers though there is no working timeline given by President Trump. Determining the cost and productiveness of the troops in Afghanistan, the businessman turned President of the United States is now interested in withdrawing those troops from this costly war. The uncertainty produced in the region thus has translated into a situation where the other regional actors are responding to the reservations by aligning their own interests. For these countries, there is no uncertainty about the bottom line. The White House is looking for an exit with the shortest considerable timeline. This has also been confirmed by the departure of ex-trump advisor on Afghanistan, H.R. McMaster, and the appointment of Iran and North Korea focused, John Bolton as his successor. The US military commanders are seen moving quickly to finish the job. 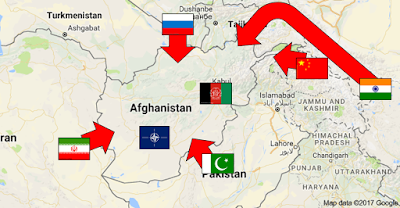 The situation has become so obscure that the other powers in the region — the two influentials, China, Russia and neighbouring Iran, India, and Pakistan — have started recognizing their security options, threats and opportunities once the United States fully withdraws, while minutely weighing in the limitations of the Kabul government. The US is building up the strength of Afghan units with a re-energized air campaign and new advisory units emplaced with Afghan army battalions while the administration pushes for talks with the Taliban in order to bring a negotiated end to the conflict. China has made it clear that it will support Afghan government-led efforts to negotiate an end to the conflict with the Taliban – an approach which is supported by the United States. It has also signed a defence agreement with Afghanistan to build a base in northern Afghanistan and set up a trilateral contact group with Afghanistan and Pakistan to combat terrorism. Moscow, on the other hand, has heightened cooperation between Russia and Pakistan that is empirically visible. In February of this year, Moscow appointed an honorary consul in the city of Peshawar, Pakistan. Moreover, the addition of Russian language signage in the tribal belt and even around Islamabad also reflect upon the camaraderie both the countries are enjoying. Iran’s concern about ISIS spillover beyond her boundaries can be seen as a reason behind its move to cement relation with Pakistan. In the past Iran and India have traditionally worked together at many visible times, however, as India has now moved closer to the United States and Israel, Iran has begun to take on a more adversarial tone vis-à-vis India. This became quite visible in 2017 when Iran rejected Trump’s call for greater Indian engagement in Afghanistan and criticized Indian military actions in Kashmir. Other small non-aligned countries like Kazakhstan, Uzbekistan, Kyrgyzstan, and Tajikistan have joined Russia and China in the Shanghai Cooperation Organization (SCO) thus putting their weight behind these big regional powers. Apparently, India seems to be the only odd man out in the aligning of interests in the region. It has a long and most of the time troubled relationship with both China and Pakistan having a history of hostile conflicts with both. Her relations with Iran have become more difficult in recent years as New Delhi deepened her relations with the United States. This new friendship with the US has actually dismissed the chances of allying with her long-gone love of the past, Russia also. Russia is the dominant military partner for Central Asia while China takes the lead in economic activities. Owing to the changing US policies in Afghanistan, both the countries, for varied reasons, are concerned about the ability of the Afghan government to keep control of its territory and its capability to fully contain the radical elements without the support of US army. Besides, they also recognize the importance of the role Pakistan is playing in reigning in the militants. And this recognition has made them adopt a two-track policy: providing support for the Afghan government while trying to get Pakistan on board vis-a-vis the Taliban. This is coming at a time when the United States has relegated Pakistan’s role in the Afghan conflict culmination strategy and blocked the military assistance funds to Islamabad on the pretext of not doing more. The inability of the Afghan government to address the prevailing security situation is having a negative impact on her economic development consequently leading the major regional powers to look for other options to stabilize the region. Moreover, India will never put her boots on the ground because she is still been haunted by her failed experience with intervention in Sri Lanka in the 1980s. Also, given the uneasy relationship with Pakistan and Iran, the geography of the region precludes an easy way to do this and Indian army is neither trained to nor have the courage to go for a war in this terrain single-handedly. 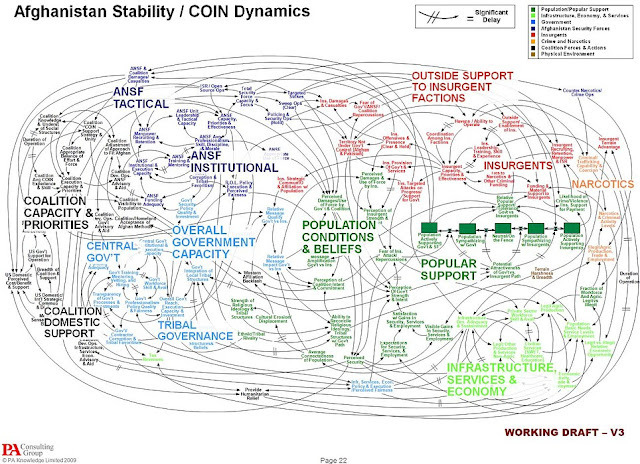 Stakeholders in Afghanistan need to understand new ground realities. 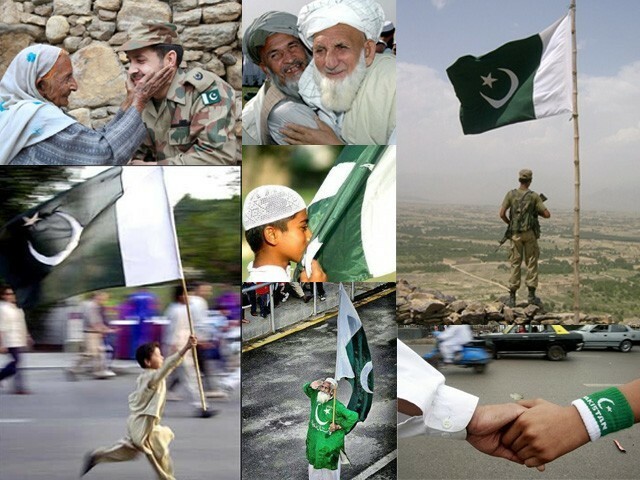 Any viable regional mechanism for taking on the Afghan cauldron cannot seem possible without having Pakistan on board. Especially at a time when both Pakistan and Afghanistan are on the course of redefining mutual relations. For a peaceful and economic exit plan, the US also cannot deny that Pakistan provides unmatchable logistic routes for the foreign forces engaged in the Afghan war. Routes through Pakistan are the shortest and cheapest and presently are the safest owing to the Pakistan army’s resolve to ascertain peace in the country. Another exit option could be through aligning the SCO with US exit policy since all the major regional powers are available under this one umbrella. Interestingly, and quite contrary to the US beliefs, the members of the SCO also trust Pakistan of being the lone brave lion to handle this menace impeccably. A better understanding of regional sensitivities will help the US to better grasp the situation in Afghanistan if she really wants to end this decades-old deadly conflict.